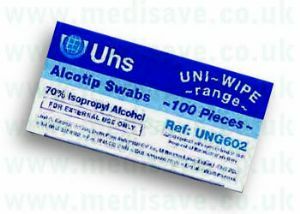 Uni-Wipe Pre-injection Swabs per Box of 100. Home > PRE INJECTION SWABS. 100 Alco-tip swabs - an easy to grip non-woven fabric prep pad saturated with 70% isopropyl for skin cleansing prior to administering an injection. Presented in individual sachets.